One of the more interesting scenes in the book “Catch 22” is when the bomber crews decide the best way to avoid flying a dangerous mission into enemy territory is to get the Germans to think that the front line has been moved. So they change the front line on one of the maps knowing full well that a German spy will see the new line and report back to his HQ. Sure enough, the spy takes the bait. He reports where the Americans are showing the front line and the HQ Staff figures that their map must be in error and orders the troops to pull back behind the ‘true’ font line. The Chinese are masters of nuance and have been for thousands of years. 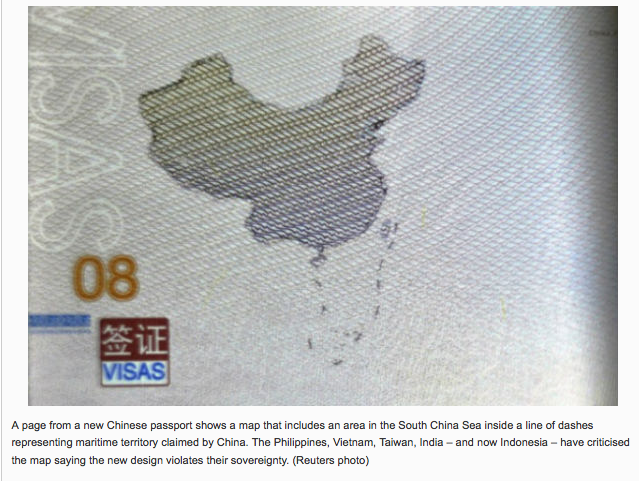 By printing their perception of borders the Chinese have cleverly managed to tick off one of their Asian neighbors. Assuming that the move was intentional, this illustrates how the Chinese leadership, department of state and other ministries have all cooperated to influence the outside world at little or no cost. Something that perhaps we could all learn from. It's not just Indonesia who are unhappy about the maps in the passports - India is unhappy too. Seems that they've been quite successful in mobilizing anti-China sentiment.